Christine is the co-founder and President of Evidation Health. 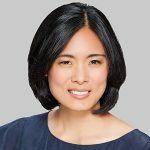 Previously, Christine was the co-founder and Chief Operating Officer of Sense Networks, developers of the first machine learning platform for mobile phone activity data (exited to YP.com). She has also held roles at 3iGroup (Paris), Microsoft XBOX and co-founded Chicago-based Channel IQ, a product analytics platform. Christine has a BA from the University of Washington and an MBA from HEC Paris. Note: Speaker biographies were written at time of speaking engagement and may not reflect their current job title and position.